The suite, which is open for viewing through the roof, is a rendition of the room in which we stayed before it was renovated after a fire. On October 15th Lou and I will celebrate our 33rd wedding anniversary. Words cannot express how blessed I feel to be able to share my life with this wonderful man. We have so many memories, but one in particular occurred at this time 7 years ago. We spent our 27th anniversary at a magical 15th-century inn in Bretforton, England. The Fleece Inn is known as an architectural treasure in the UK—it’s a half-timbered building which had remained mostly untouched from the mid-1400s until a fire swept through the upper floor in 2004. It had been carefully renovated to preserve its integrity and the pub’s atmosphere and architecture remained virtually intact. We chose The Fleece Inn as our destination because we had the miniature version of the historic inn by artisan Pam Throop. She was enamored by The Fleece’s authenticity and spirit, and we, too, fell in love with the inn through her rendition of it. 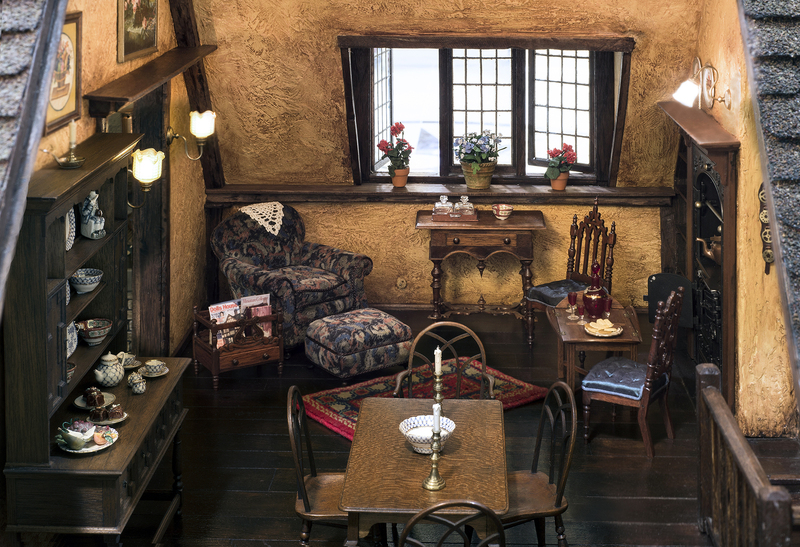 It was the last miniature house she made before she passed away and I shall always hold dear the time we spent together as she thoughtfully staged each room. 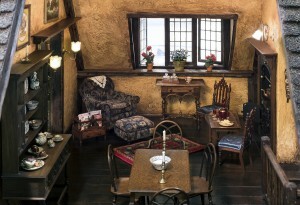 Years later when Lou and I visited The Fleece, it was if we were inside our own miniature. History and folklore merged beautifully with the autumn landscape and as we listened to the locals, the items Pam had selected and strategically placed became even more special. Shirley Whitworth’s doll representing the inn’s last private owner, Lola Taplin, took on new layers of personality with every story we heard. Townsfolk said she lived her entire 77 years at the inn and died in front of the fireplace in the pub. Her dedication to The Fleece is symbolized in real life and in miniature by an owl on the exterior of the buildings. Lou in his breeks and boots after a day of hunting game birds in the country. The pub in the miniature is filled with colorful characters and has a working beer tap constructed by Ian Berry. Whenever I look into this room I can almost hear the locals chatting in lively, yet polite, dialogue reminiscent of a Jane Austen novel. 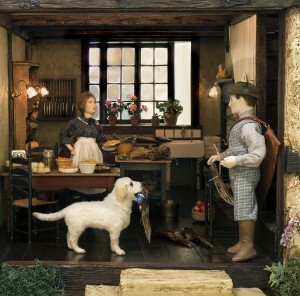 In the kitchen “Lou” is decked out in his breeks and boots discussing the day’s hunt with the cook. The game birds signify the sport my husband so enjoys during our visits to the UK. The dog is, of course, reminiscent of our own Labradors over years. Many miniaturists created items in The Fleece Inn miniature. You are too numerous to mention, but I thank you all for helping to make my memories with Lou and Pam into a piece of art I can always visit. Happy anniversary, dear Lou. I look forward to many more memories with you in life and in miniature.